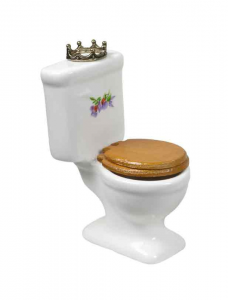 The toilet is known by many names: the lavatory or lav, the loo, the water closet or WC, the privy and the latrine. These are just some of the words associated with this popular bathroom fixture. However you say it, the toilet has been an ever-present object in our human history. There are records of toilets in ancient times and in the Middle Ages as well as from the 16th century onward. 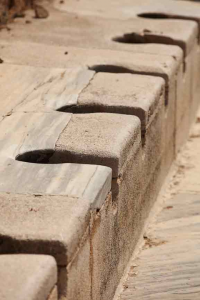 Ancient toilets have been found in modern-day Scotland dated 3,000 B.C., in Ancient Egypt approximately 2,500 B.C. and in Roman times around 60 A.D.
A toilet in the Middle Ages was known as a garderobe, which is a Middle English word meaning “a private chamber”. Garderobes were located on the side of a castle so that waste could exit the vertical shaft. It was in the 12th century, at Portchester Castle that monks designed a stone trough that led sewage to the sea. Any kind of sewage system design was not seen again until the late 19th century. In 1596 a flushing toilet was introduced by Sir John Harrington, but his idea did not receive much recognition. Chamber pots were utilized from late 1500s to late 1800s. These were ceramic or metal pots that were used in the home and emptied by servants. The servants took these chamber pots to cesspits or the nearest gutter. The waste was then taken away to be used as a fertilizer. This method was eventually seen as unsanitary and ineffective as cities grew with the Industrial Revolution. The need for underground sewage construction was acknowledged and put into practice. As a result, the flushable toilet grew in popularity. In the past 300 years, there have been a multitude of inventors that have helped shape our modern toilet. In the 1700s, two inventors (Alexander Cummings and Joseph Brahmah) worked to produce a flushing toilet design. Perhaps the most famous inventor in the 19th century was Thomas Crapper. Although he did not invent the toilet, he did have 9 patents directly related to toilets and plumbing. The pull chain for flushing is one of his inventions. In 1852 the first modern public lavatory opened in London. This directly coincided with the creation of the first modern sewer system. Shortly after its appearance in London, the toilet was seen in America the homes of the wealthy. Finally, at the beginning of the 20th century, the toilet was widely available to all levels of society. Having plumbing trouble in your Annapolis home? Call Heidler Plumbing at (410) 268-7191 to take back control of your home temperature.